Do you find printing shipping labels for each package exhausting? What if you could print only one shipping document that would include details of multiple packages from multiple orders? This is possible with EasyPost WooCommerce USPS SCAN Forms Add-On from ELEX, that easily generates SCAN Forms for multiple EasyPost orders. The SCAN Forms are generated only for USPS carrier. Instead of the mailman having to scan each package, they can scan one form and all your shipments will be marked “Accepted for Shipment”. This will drastically save time and increase the speed of your pickups while saving the mailman a significant amount of hassle. 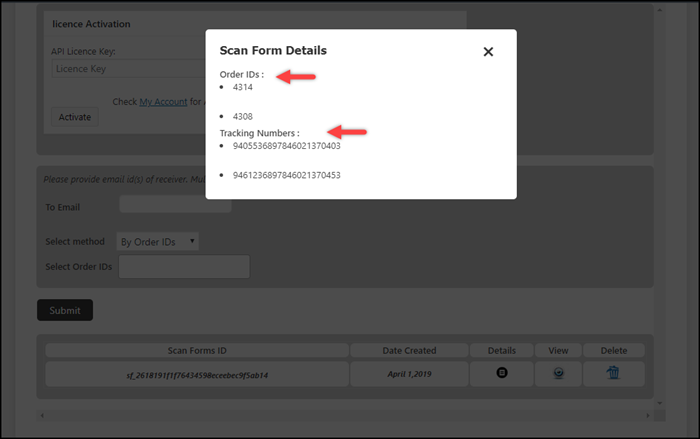 The add-on uses WooCommerce Order IDs or Order date range conditions for generating SCAN Forms. This add-on works only with ELEX EasyPost (FedEx, UPS & USPS) Shipping & Label Printing Plugin for WooCommerce. To generate SCAN Forms, you need to create USPS shipments first. The add-on will skip generating SCAN Forms if even one of the order shipment is not created. What is SCAN Form? How does it work? The ELEX EasyPost Shipping & Label Printing Plugin for WooCommerce lets you access services from FedEx, UPS, and USPS. Our constant efforts to make this plugin the most functional WooCommerce plugin for EasyPost shipping has made us an EasyPost Approved Integration Partner! Access domestic & international real-time rates from FedEx, UPS, and USPS. Configure USPS Flat Rate boxes. Ensure packages with Insurance option. Specify Commercial or Residential address type. Show estimated delivery date, and much more! You can skip printing a large number of EasyPost shipping labels for packages, and instead opt for generating USPS SCAN Forms. This will cut the clutter of handling packages and makes the job of delivery personnel's a lot faster and easier. 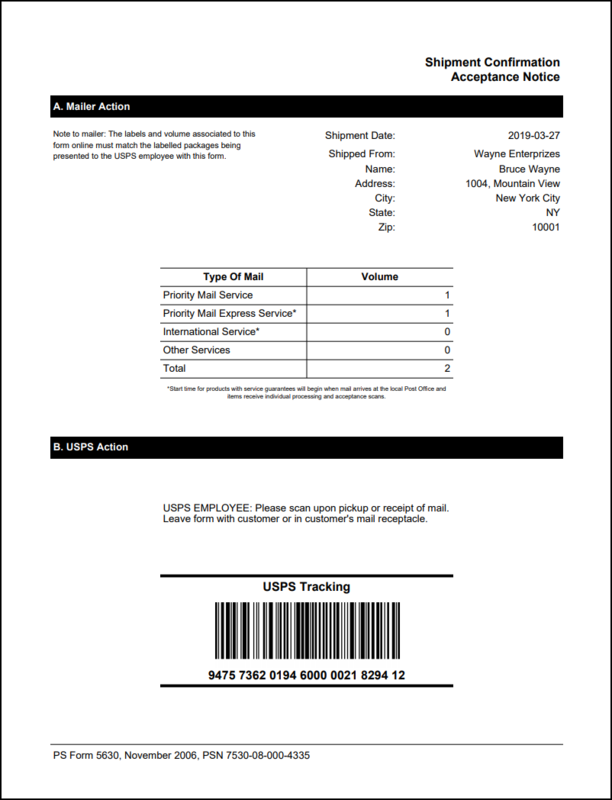 A sample screenshot of the USPS SCAN Form is shown on the right. You can send the generated SCAN Forms to desired users via email. You can specify one or more email IDs as the recipients. 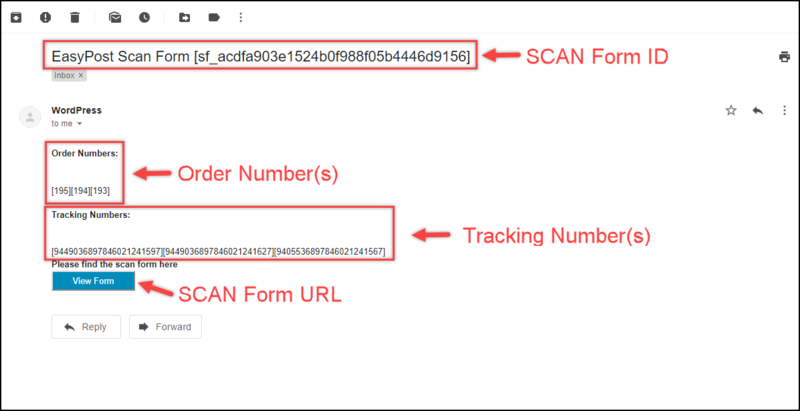 The email is identified with SCAN Form ID and contains Order ID, Tracking number, in addition to the link for SCAN Form(s). Make sure you create shipments for all the USPS orders before you start generating SCAN Forms. You can select one or more WooCommerce orders to create SCAN Forms. You can select the start date and end date range for generating SCAN Forms. The SCAN Form will be created for the orders whose shipments are created and fall under the date range. The add-on has a user-friendly interface that allows you to quickly view details of the SCAN Form, view the SCAN Form PDF file, and delete the SCAN Form. The screenshot on the left shows quick details of a SCAN Form. The details include Order ID(s) and Tracking Number(s). Can the plugin work without the ELEX EasyPost Shipping plugin? No, the plugin is an add-on for the ELEX EasyPost shipping plugin. The shipment creation and label generation in the add-on works in accordance with the plugin. Can I create EasyPost shipments with this add-on? No, the add-on generates SCAN Forms only for orders with the shipment created. If the shipment is not created for even one of the order in the selection, the add-on will skip the SCAN Form generation. Hence you need to create shipments manually. You can rather use the bulk shipment creation feature of ELEX EasyPost Plugin to make your job easier.